Every once in a while you have to clean your working space. Typically this means that you need to spend one or two Saturdays every month on cleaning duties. But it doesn’t have to be that way. Follow these steps and you will clean your office in a matter of hours. That way you will still have time to go out with your significant other or go partying to one of the many famous London bars. Put down the vacuum cleaner and the broom and first start by tidying your desk and working area. You don’t want to destroy by accident any of your company’s important documents or break your favourite mug with the mop’s handle. Put all loose papers in folders. All mugs and glasses must be placed inside of your desk or in the kitchen area. Make sure to collect all paper clips, pencils and pens and put them in your desk organiser. An interesting fact is that the things that gather the most microbes and dirty are your office phone, keyboard, mouse and tablet. 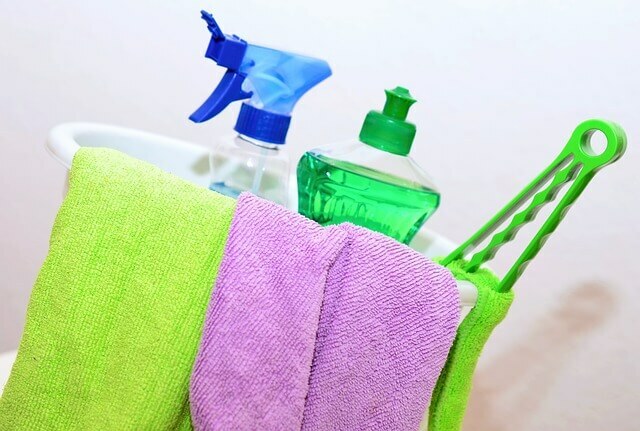 You should take special care in properly cleaning these items on weekly basis. Use a solution of rubbing alcohol and water. Pot it on a soft cloth preferably microfibre and wipe your phone. Not just the handle, the whole phone and make sure you clean all its buttons. First, wipe the surface with a dry microfibre cloth to remove all the dust. Then use a clean cloth to apply the cleaning solution and gently wipe all surfaces. You can use this mix to clean your laptop or computer screen. Disclaimer: be very careful not to “drown” your electronics. You want them to keep working, after your cleaning attack. Remove all that can be moved from your desk and polish it with a microfibre cloth and the chosen cleaner. Place back all your office belongings and organise them properly. Using a fabric cleaner, wipe your office chair with special care around the arm and read rests. These are the places that tend to get the most stains. Usually, at the end of the day, all the trash bins in the office are full. Before starting with the actual cleaning make sure to collect all the rubbish from them. Afterwards, vacuum the floors in your working area. Clean all the dishes in the sink. While at it, clean the sink with dishwashing liquid as well. Wipe all the kitchen counters with a damp cloth. If there are some stains use dishwashing liquid and soap them out. While you are at it wipe the table and the chairs. Clean the microwave with the good old mix of water and dishwashing soap. Put everything in order, make one pile for books and another one for magazines. Wipe the tables and chairs using different cleaning supplies according to the surfaces and fabrics you are cleaning. Pour toilet cleaner in the toilet and leave it for now. Use a specialised cleaner to wipe the sink and the taps. Fill a bucket of water and pour it gently into the toilet while scrubbing it. Flush the toilet a couple of times afterwards. Use a cloth and a mixture of toilet cleaner and water and wipe the toilet with it. Use the same mixture to mop the floors. Get a window cleaner and a microfibre cloth and clean all mirrors. Don’t forget to change the toilet paper and put in new towels. That is it. You have officially cleaned your office!